Inside London's Abbey Road Studio Two, the sound-proofed walls quaked with a reverberant roar. Standing above the VCS3 Synthi A, Roger coaxes body drenching electronic oscillations from the miniature machine, sending warm enveloping waves of ever increasing intensity into the room's sacred air space. As the propulsive composition reaches its crescendo, the air hangs thick and wet, drenching every ear with exhilarating new sounds. The song is, of course, "On The Run," yet another brave Floydian excursion into uncharted sonic territory, infusing the mundane with the sublime. Behind the obvious percolating exterior of the song are some very poignant emotions; all of the Floyd developed at some time an anxiety of traveling especially flying. Nick Mason explains: "We had one particularly scary flight back from Japan in a thunderstorm. After that, we were just dreadful. Someone said, "You need to learn to fly." So I did. So did Steve O'Rourke and Dave. It cured me. I absolutely love it now. I still fly." Some fans may consider the Gilmour/Waters composition "On The Run" to be an aberration in the Floyd's extensive canon, while the minority of others, including myself, view the song as a prototype of Techno with its trance-inducing throb and nocturnal canopy of voices and texture. The very essence of Techno is to create something you can't possibly imagine by the utilization and innovation of new sounds extracted from the emerging analog and digital technology. Often in the process, accidents and surprises occur revealing astonishing new forms of music. Such sub-genres as Electro, Ambient-House, IDM (Intelligent Dance Music), Trance, Drum and Bass, and Glitch are all the progeny of Techno's original gene-pool. We all acknowledge Kraftwerk as the pioneers of the electronic music form, but to give credit where credit is due; Pink Floyd's pioneering efforts with the VCS3 Synthi A, not to mention many other advanced production techniques, contributed important genes crucial to the evolutionary path which produced the many facets of Techno as we know today. Synthesizers are by their very nature cold, motionless machines, that is until humans coax imaginary sounds from the programming circuitry, giving life to often totally new musical forms. It was David Gilmour who first visited BBC Radiophonic Workshop inventor Peter Zinovieff in his garden shed in Putney to see his prototype of the VCS3 synthesizer. Intrigued by the new machine, the Floyd went on to procure a scaled down version known as the EMS Synthi A, also known as the "The Portabella," a portable VCS3 in a briefcase. As always, the group unbounded by their imagination and energized by the new technology, set off to create new sounds yet heard outside of studio walls and synthesizer workshops. David Gilmour sets the scene: "We created a kind of sound collage to show movement and travel... It was a very serious attempt to achieve a certain effect. I put an eight-note sequence into the Synthi and sped it up. Roger thought it wasn't quite right. He put in another, quite like mine, and I hate to say, it was marginally better. We added the footsteps, the slide guitar zooming about wildly, and the voices." Pink Floyd began using their new VCS3 synthesizer back on the Obscured By Clouds album, yet all they managed to produce at the time was long eerie droning sounds, as heard in the title track and the haunting "Absolutely Curtains." By the time of Dark Side of the Moon's creation, the Floyd, with the aid of VCS3 technicians, were producing some very innovative sequencer loops and sound textures from their new synthesizers. Roger explains the creative process: "The VCS3 was a synth that was invented and manufactured by a man named Peter Zinovieff. It was called the Putney VCS3 because he lived in Putney right here in England. It was just a bank of three or four oscillators that generated sine waves, square waves and saw-tooth wave signals, which you could program through a ring modulator or a series of filters, or an envelope generator in different combinations. If you watch Pink Floyd Live at Pompeii carefully in one small shot, you will see me producing "On The Run" out of a thing which looks like a little black suitcase; that's the Synthi A. It's actually on film of me twiddling the knobs to make the sequence that we actually used. This lead to the running footsteps that were done in a tunnel underneath the Cromwell Road in London, that runs from the science museum to Kensington to South Kensington Tube Station. It's long, about a half-mile long and it's lined with white ceramic tiles. if you get somebody in a pair of leather shoes running in it; it sounds great! Which is what is on the record." The big question is: Are Pink Floyd the influencers or the influenced? There's not such an easy answer to that query, since scarcely little original music is born on an island, completely isolated from other outside influences. Not even Jamaican Reggae was formed without considerable R&B influences blasted in from mainland American radio stations. Certainly, echoes and cadences of "On The Run" can be heard in Kraftwerk's 1974 landmark album Autobahn, specifically the twenty-two minute title track; a slow motion Electro road trip through the asphalt jungle amidst gleaming cityscapes and rolling countryside. The key exponent in creating these new sounds were portable and affordable new synthesizers like the VCS3 Synthi A, manufactured by Electronic Music Studios (London) Ltd. or EMS. But Kraftwerk were not the only users of this new machine, in fact, by the time of Autobahn's production, the group were also equipped with the more versatile and user-friendly American mini-Moogs. Other famous users of the VCS3 synths include the BBC Radiophonic Workshop who composed the Dr. Who television theme song, Brain Eno's short tenure with Roxy Music, Pete Townsend used one to help compose the Who's Next album ("Baba O'Riley" is generally recognized as the first notable VCS3 note sequence), as well as Tangerine Dream on all their early albums, Klaus Schulze, Georgio Moroder and the perhaps most wigged group out of all, Hawkwind. "You've never seen anything like it in the pop field for technical perfection production-wise. Indeed it goes beyond perfection." proclaims the advertisement for Live at Pompeii in the UK's Melody Maker music paper back in 1974. Concurrently, the American movie industry trade paper Variety called the film: "A stunning audio-visual experience... so ably lensed, recorded and put together. Unique!" From the mainstream newspaper media to the underground music press, the Pompeii film provoked some rather diverse reactions. 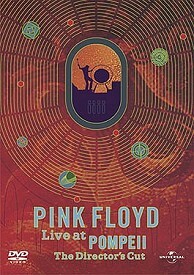 And not surprisingly, the overall critical response to the premiere of Live at Pompeii was mixed, with accolades and criticism alike for the style of the film as well as the Floyd's music. The Edinburgh Evening News, after the film's first ever screening in September 1972, said, "There has not been a film made about any pop group to beat this for all-around quality and technical presentation." The venerable Melody Maker also observed: "Pink Floyd's music is moderately atmospheric, without building into anything dynamic. Rather, this is a visual experience, using Pompeii's ruins and volcanic environ's as a backcloth for musicians at work." Pink Floyd were generally happy with the outcome of the film, with only some reservations voiced. A rambling conversation with Nick Mason in the UK music paper Sounds in August 1974 revealed the problem: "I don't think we perhaps took quite the interest in it that we should have done, although Adrian Maben, the guy who made it, was quite interested in having us say what we thought about it all along. It's not bad, but I'm not entirely happy with it... with the interviews particularly. I think perhaps we should have got more involved in trying to say something about what's happening and what we do as a group... something that would be interesting and would last." Bandmate Roger Waters described the film as "Just us playing a load of tunes in the amphitheater with some rather Top of the Pops-ish (a popular weekly UK music show) shots of us walking around the top of Vesuvius and things like that. I liked it because it was like a big home movie." Much has been made of the Floyd's muscular performances in the Live at Pompeii film, particularly Nick Mason's stellar drumming showcase "One Of These Days" - arguably his finest career moment. In 1986, this film clip turned up in Life Could Be A Dream (directed by Mike Shackleton); a 26 minute mini-movie encompassing Nick's lifelong pursuit of motorsports and compressed career highlights with the Floyd. The Floydian points of interest in the film include original archive footage filmed by Nick, the most outstanding of which are clips of the Floyd's infamous Crystal Palace Garden Party gig (London, May 15, 1971). Situated right in front of the Crystal Palace stage was a sizable pond, there the Floyd arranged to have an enormous fifty-foot inflatable octopus rise majestically from the foggy (actually manufactured dry ice) lake. During "Saucerful of Secrets" the menacing creature rose, with the help of a water-logged roadie, extending its eight elongated tentacles above the water's surface to reach the grassy bank. Perhaps the most interesting part of the Life Could Be A Dream movie is some of Nick's own behind the scenes footage of the making of Live at Pompeii, including one scene of Nick operating a large 35mm camera. Sadly, this rather obscure yet interesting Life Could Be A Dream movie has yet to be released commercially. Is anyone out there listening? The Crystal Palace Garden Party gig has a somewhat tragic anecdote. There in the standing pool of murky water were inumerable and quite happy schools of generally healthy fish, swimming their tranquil little lives away in perfect solitude. Now if you are the least bit upset by the mention of dead fish, turn away now. With that warning, the wrath of death has so far overlooked Pink Floyd concerts, save for a few hundred or so not so lucky cold-blooded aquatic vertebrates at Crystal Palace. For the concert, special amplification and speaker systems were constructed by Charlie Watkins of WEM PA, the venerable British electronics firm, who also designed the enormous sound system so prominently seen in Live At Pompeii. The concert was indeed splendid, everyone enjoyed themselves, and the sound was overwhelmingly perfect. Only one very smelly problem surfaced as Charlie described: "Due to the reflective surface of the pond in front of the stage, there was a great gain in sound velocity." As a result, the Floyd's fearsome arsenal of sound equipment pummeled the pond's inhabitants delicate nervous systems with such insurmountable and persistent blows, that the fish succumbed to the sonic assault by going into a permanent state of psychedelic trauma. For the next morning, several hundred not-so-fresh fish were found floating motionless on the pond's otherwise inviting surface. Moreover, the Floyd were presented a bill for the dead fish. The last word, and certainly the most important opinions about music, art, film, books, etc. rest with the true fans, old and new alike. A casual scan at customer comments posted at a very famous internet movie database website reveal that Live at Pompeii has taken on quite a life of its own. For the majority of fans, Live at Pompeii is the perfect introduction to the early Floyd's majestic, progressive compositions. Their enthusiasm for the group in the present tense regarding Live At Pompeii mirrors my own original sentiments for the film thirty years ago. Some Floyd fans favor the Pompeii film without the interview footage, citing it breaks up the momentum of the musical performances, while a surprising number of viewers praise the high quality and innovative style of the cinematography. However, the overwhelming majority of comments capture Floyd fans raving over the band's exciting performances set among the mystical ruins of the Pompeii site itself. In retrospect, Live at Pompeii is just as relevant today as it was the day of its release, speaking to a whole new generation of quality conscious music fans. Next time around in our continuing quest to rediscover Live at Pompeii, we'll kick around in the dusty grounds of the ancient city, while exploring the science of volcanos in relationship to Mount Vesuvius; the very volcano which buried the city of Pompeii under many layers of suffocating ash back in 79 AD. And who knows, maybe I'll stir up some tasty old Floyd stories along the way.